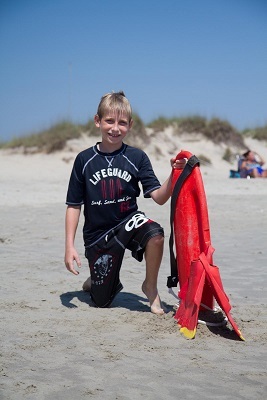 Welcome to the information portal of the Corolla Lifesaving Association, Corolla's nonprofit association of beach lifeguards, open water rescuers, and volunteers dedicated to keeping the beaches and surrounding waters safe and fun for all to enjoy. 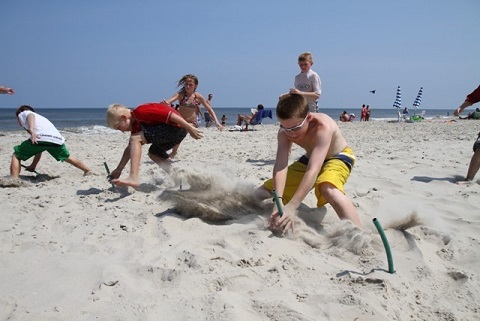 Our mission is to promote beach and open water safety through educational programs and other initiatives that foster public safety awareness, and have fun at the same time! The beaches and bays of Currituck County offer amazing vistas and an escape from the routines of everyday life. It's the perfect get away for families wanting to reconnect with each other, or simply to relax under the umbrella and let the sound of gentle waves transform you into a state of blissful relaxation. As with most great rewards comes many risks to the beach goers and fun seekers that visit the Outer Banks each year. Rip currents can be killers. These are powerful currents of water flowing away from shore, through the surf zone, and out past the line of breaking waves. The greatest safety precaution that can be taken is to recognize the danger of rip currents and always remember to swim near a lifeguard. Our efforts to prevent open water drowning and promote safety in the aquatic environment include SEALS (Safety Education and Aquatic Learning) and Jr Guards. SEALS is a free 2 hour mini-camp for kids ages 6 to 12, and Jr Guards is a 4 day program for kids ages 8-15. We depend on public support, so please consider donating, and thank you! © 2019 - Corolla Lifesaving Association, Inc.